Renting right on the beach at The Inn on Madeline Island. We have single person SUPs and large multi person Big SUPs! Our SUPs are ATX lightwieght high quality SUPs. We do have a couple plastic backups too, feel free to pick from what is available. Most of them are 10 feet, but there is one 11 footer. 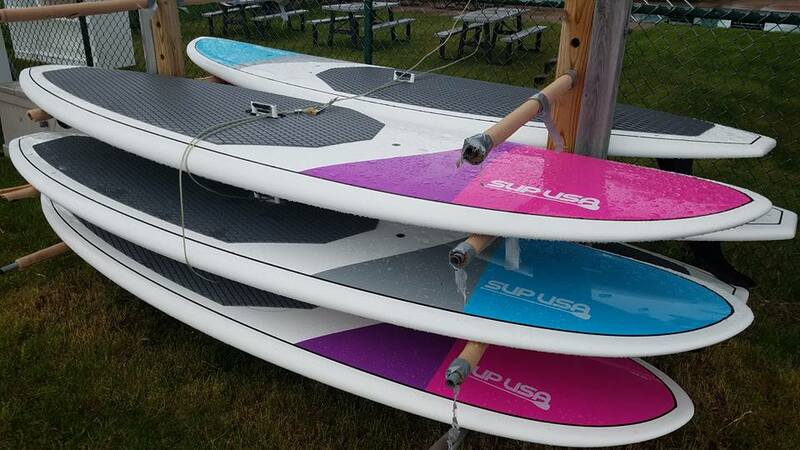 Our Big SUPs are 18' and 22' feet long. They are advertised for 6 adults, but you can try to fit as many people as you like on it. Everyone just has to have a life jacket. We are going to have one anchored and you are welcome to get your family Holiday Photo on it or try balancing on a my SUP Barges. I first went and found this because I am a larger person myself so simply put I had to have the largest SUP they make. Now I have 2 of them!